A new business mantra of every organisation is to cut costs. Reducing overall spends on Information Technology is one of the most prominent heads among those. They have learnt from the experience of installing high-end dedicated software suites and falling prey to huge installation and migration costs, licensing fees and renewal costs - year after year. In this scenario, most of the small and medium business enterprises have begun taking a recourse towards Open Source technologies like PHP /MySQL, etc. Starting with operating systems (Linux), Web Servers (Apache), database Server (MySQL) and Server side Scripting language for developers (PHP), everything is now available under the GNU General Public License free to download & use. Most of the regularly required high-end web applications for organisations like Content Management Systems, ecommerce websites, Product Catalogs, Customer Relationship Management Systems, Online support and Ticketing management systems, ERP, Lead Management, E-learning modules, web conferencing modules and many more are available out of the box and free to download. 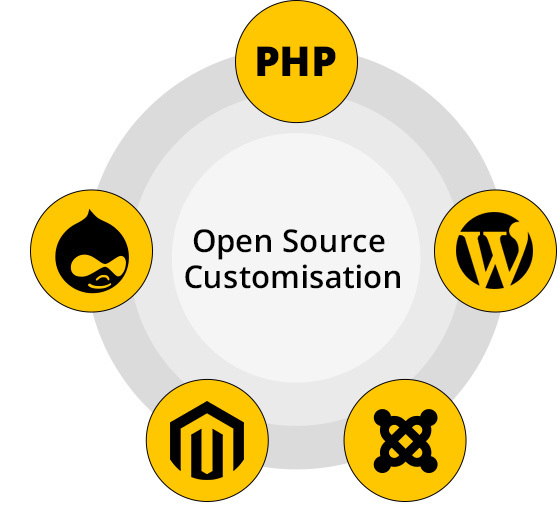 What you really need is PHP developer & Open Source Customization company to implement the same. If you are planning to start an internet venture like a Social Networking site, Job site, Online Live Tutor, Matrimonial site, Online Travel Site, Online personalised gifting site, article oriented site, forums and more, an open source framework is already available. You name the web application and in its all possibilities you are available with an open source option for the same. However, most organisations lack the technical expertise and working knowledge to develop web application using an open source platform built on PHP / MYSQL. In addition, the fear of not getting any support after investing in Open Source Infrastructure acts as a deterrent. Since Open Source projects, frameworks and codes are developed after keeping in mind a general usage, many developers add additional codes, plugins and modules to incorporate the maximum number of industry applications across users. This creates a problem when you try to use it out of the box. First we understand your requirement for web application or intranet project or even your Internet venture; you name it we have it! It is never used as is. But, there is no point re-inventing the wheel either! The whole project comes to you LIVE after testing, and with 30 days of free support followed by a paid support as and when required. Rest assured that you would never need to come back to us, at least for the scope of work we agreed upon. If you are looking to reduce your Information Technology Software Infrastructure cost talk to us.